There's not a lot new to say about this sweater that hasn't been mentioned in Bringing in the New, except of course, that it's finished. And I made the decision to go with a simple hem instead of the split bands at the bottom. The pattern, Burda Pullover 11/2012 #128, is actually the first Burda pattern I've ever used (though I've sewn a Burda-inspired garment.) 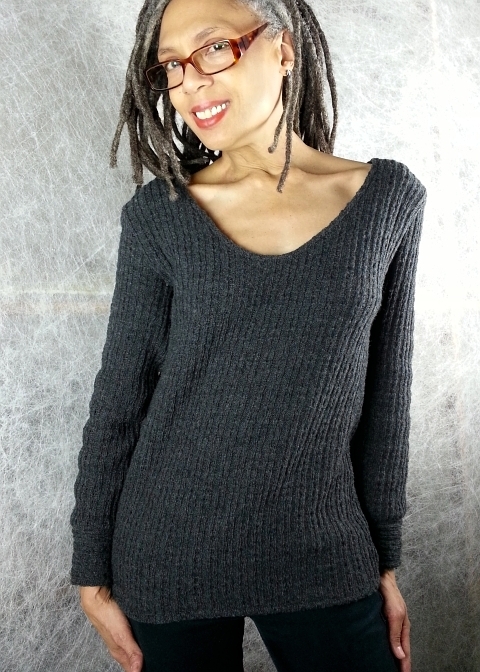 The pattern is a casual pullover, with a rounded v-neck, slightly dropped shoulders, and a side split hem band. But I made a few changes. My viable substitute for iron-on Vilene bias tape (mentioned in the Burda pattern, but oh so difficult to find in the US) was a folded strip of soft black mesh. This served as a hem tape for my neckline. (Next time I'll be sure to have good old knit stay tape on hand.) And instead of hand sewing the neckline, I decided to machine stitch the neckline. I rarely machine stitch any type of hem! But after I turned under and steamed the taped neck edge, I sewed a narrow zigzag from the right side. I know, not really revolutionary, but positively radical for me. Then, I think because I wanted more practice with my “new" technique, I did the hem at the bottom of the sweater the same way. I think this would be an excellent pattern for a beginner getting used to working with sweater knits. 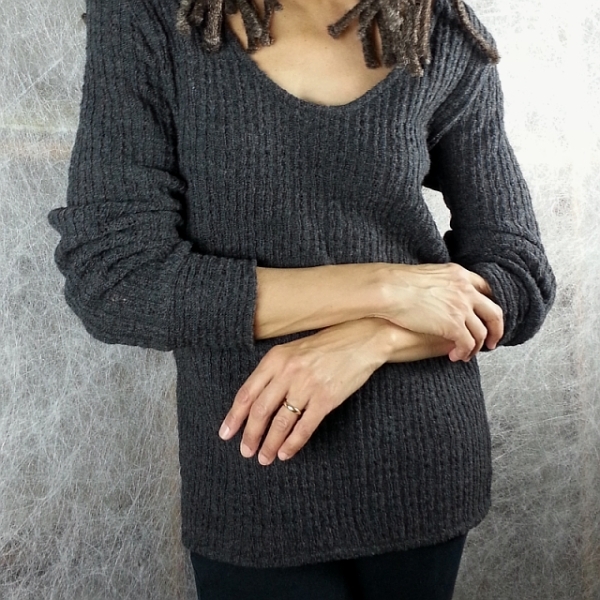 This sweater was relatively quick and easy with hemming and simple bands at the cuff. I love it because it's so comfortable. The slightly fulled Westerly fabric played nicely with a 3-step zigzag finishing on the seam allowances. Properly prepped wool is good that way. Remember if fulling wool, practice on a swatch first. Please see previous comments on this subject. Other than making the original split hem band, I don't think that I'd make any other changes to the pattern next time. But I may try a different substitute for Vilene bias tape -- either the earlier mentioned knit stay tape. Or this. Last Saturday I bought a couple yards at Pacific Trimming. Unfortunately it's not on their website, and I should have asked more about it while I was there. 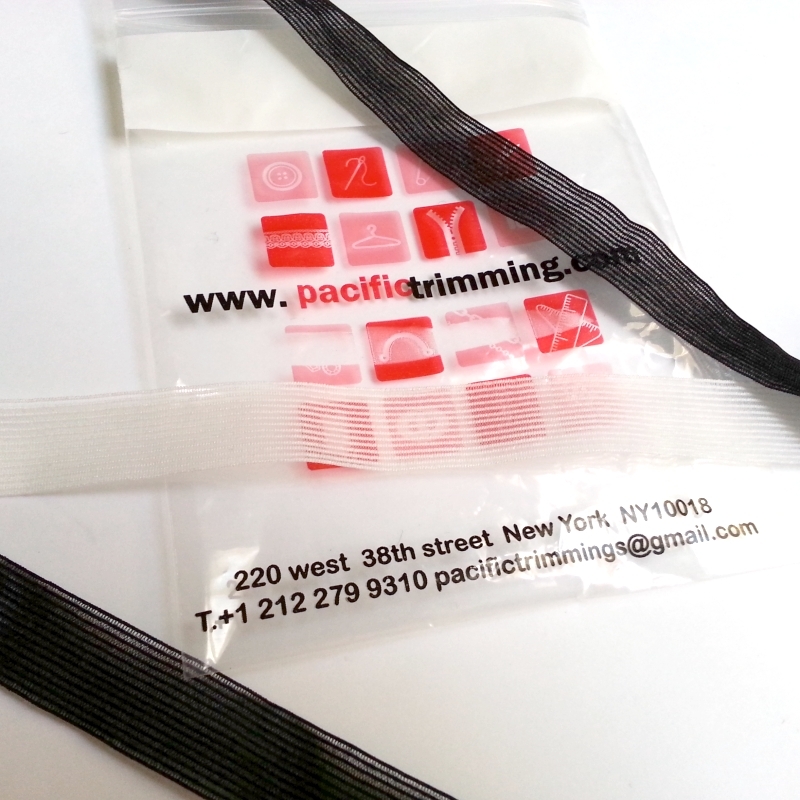 Though it looks like some type of edge tape or binding, it's actually a very lightweight elastic. It was in same section as the transparent elastic. If you know what this elastic is usually used for, please let me know. I'm going to try it as a hem tape with some scraps, attaching it to the edge with a lapped seam. I'm also pretty sure it would work well with shoulder seams. We'll see how it goes. Regardless, this is a gorgeous sweater and I am really inspired to try some of your wool fabric. I would love to know more about the exact details of how you fulled this fabric and left you several questions on the post that this links to. Thanks for the inspiration! Not a problem. Questions were answered as best I could on that other post. Thank you. I'm glad the sweater inspires you to try a technique that's new to you. Also thanks for giving me a prompt for a new blog post! Just catching up on my blogs! This is so elegant on you - that neckline is beautiful! It's a lovely use of your fabric! Thank you! This sweater is getting lots of use!